“Therefore I tell you, do not worry about your life, what you will eat or what you will drink, or about your body, what you will wear. Is not life more than food, and the body more than clothing. Look at the birds of the air; they neither sow nor reap nor gather into barns, and yet your heavenly Father feeds them. Are you not of more value than they? And can any of you by worrying add a single hour to your span of life? And why do you worry about clothing? Consider the lilies of the field, how they grow; they neither toil nor spin, yet I tell you, even Solomon in all his glory was not clothed like one of these. But if God so clothes the grass of the field, which is alive today and tomorrow is thrown into the oven, will he not much more clothe you? you of little faith. Therefore do not worry, saying, “what will we eat?’ or “what will we drink?’ or “what we wear?’ For it is the Gentiles who strive for all these things; and indeed your heavenly Father knows that you need all these things. But strive first for the Kingdom of God and his righteousness, and all these things will be given to you as well”. Anxiety is a common problem. We all worry about life. We worry about school, about our jobs, about our children and about our health. Sometimes, even when we don’t have anything to worry about, we still worry. It’s kind of strange that I have nothing to worry about and that makes me worry. One comedian said, “You know, there is a day when everything goes so well and that drives me crazy”. I think these comedians know very well about life. Yes, when there’s nothing to worry about, you start to think oh my goodness, why don’t I have anything to worry about? and we start worrying about. Sometimes we have this superstition. If we have something to worry about, that won’t happen to me at the kind of superstition because often what we worry about does not get realized, so worries always follow us like a shadow. It is not a good feeling when you constantly have this dark cloud over your head. 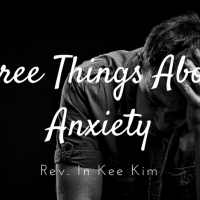 Anxiety is a psychological problem, but I believe that it is a spiritual subject to deal with. We need spiritual disciplines to overcome our anxiety. We need to deal with what is going on in our heart to deal with anxiety, and dealing with what’s going on in our heart is a future subject. Myron Augsburger, a mennonite scholar, summarized anxiety in three words, “Irreverent, irrelevant and irresponsible”, irreverent because there is no respect for God. Into this scripture, Jesus said not to worry about and he gave the main reason. The main reason was because God will take care of you, don’t worry. Simple. God will take care of you. He said, “Look at the birds of the air, for they neither sow nor reap nor gather into barns; yet your heavenly Father feeds them. Are you not of more value than they? Which do you believe that? You are of more value than those things, lilies of the field and birds of the air. If you believe that, I mean they don’t do anything but God takes care of them. If you believe that you’re more value than them, why do we worry? God will take care of your basic needs. What Jesus is saying is we worry because we don’t believe that God will take care of our needs. We should not worry about what we shall eat or what we shall drink or about our body, what will we wear. These are important things, but also, these are basic necessities of life. Jesus saying that Jesus will take care of your basic needs. We need to trust that God will take care of our basic needs and we need to experience that in life. I’ve experienced this many times in my life. All my life, I’ve lived not with much money. Even when I was in the beginning of ministry and when I was a student, I lived with just the basics. My salary was $700 and then rent was $700. After that, what do I do? how do I survive? and that’s how I lived, but even at that time, everything was all right. God is taking care of our basic needs. All this time, if we can not entrust our basic needs in God’s hands, we can not entrust anything to God. There is a big difference between the people who entrust their basic needs to God and people who don’t. There’s a quality difference. If you don’t entrust your basic needs in God’s hands, you can never become a bigger person. You will always worry about what to eat, what to wear. You can never become a bigger thinking. You’ll be enslaved to your fear, so to fight against anxiety, you have to have spiritual discipline to entrust your basic needs in God’s hands. Then your life will be enriched and you will have confidence in life. You can go beyond worrying about your basic needs. You will see bigger things in life; so about your job, about your daily living, God will take care of your basic needs. Don’t worry about it, and do something beyond your basic needs. Second, it is irrelevant to worry about things. In other words, it’s no use. Worrying does not do any good to you. Jesus said, “can any of you by worrying add a single hour to your span of life?”, you cannot do anything productive by worrying about it. Sometimes by worrying about your problems, you make the problems worse. You ruined your health both physically and mentally. It is a waste of time and waste of your energy. Spend your time and energy for the things that you can do something about it. Don’t spend that on worrying about your life, by worrying about them you get absorbed deeper into your problems and you’ll be affected both physically and mentally, so it’s no use. Then what do we do? What are spiritual disciplines? The first one is you entrust your basic needs in God’s hands, in second spiritual, a display because it is no use. What do we do? Whenever you worry, turn that into prayer. Make that as your discipline. If there is a subject that you’re worrying about, instead of worrying about it, turn that into prayer. There’s an old hymn, a sweet hour of prayer is a beautiful hymn. Let me read the verses, “sweet hour of prayers sweet hour of prayer that calls me from a world of care, and bids me and my father’s throne. Make all my wants and wishes known. In seasons of distress and grief. My soul has often found relief, our cast on him, my every care and wait for the sweet hour of prayer, our cast on him, my every care and way for these sweet hour of prayer. That’s what prayer is, when you turn your anxiety into prayer, you can defeat your anxiety problem. When you have an anxiety attack, turn that into prayer. Your prayer will become real and you will do a lot of prayer too. We all worry about things, but every time when we turn that into prayer, you’ll become prayer people not worriers, and I want all of you to become prayer people. Worries and anxieties do nothing for you, but prayer brings miracles. When you worry about things, nothing will happen, but when you turn that into prayer, you’ll experience God’s miracles. That’s why Saint Paul said this, “Do not worry about anything but in everything by prayer and supplication”. This is Saint Paul’s spiritual discipline. Whenever he worries about things, he turned that into prayer and supplication with Thanksgiving. Let your requests be made known to God and the peace of God which surpasses all understanding will guard your hearts and your minds in Christ Jesus. When you turn your worries into prayer, God’s peace will guard your heart. You will become strong. Your heart will become strong. That’s a miracle to me. You don’t have feeble heart anymore. You’d have a very strong, peaceful heart. Your life will change. Third, it is irresponsible to worry, in what ways is it responsible? Worrying to me is escapism. Worry is escapism. It is a way of escaping your problems. Instead of dealing with challenges of life, you hide behind the anxiety, even though we know that worrying does nothing to deal with our challenges because worrying is easier and safer then dealing with problems, we choose to worry so we hide in that way It is irresponsible. When life’s troubles attack us, we believer’s do not sit on our problems or hide behind our worries. Jesus said, conclusively, do not worry about things in life, but seek first the Kingdom of God and everything else will be alright. That’s Jesus principle. When challenges of life attack you instead of worrying about it, seek first the Kingdom of God and everything else will be alright. Focus on good things that you can do for other people. Don’t waste your life worrying about your problems. Focus your eyes on the things that you can do for other people. Worries, have no power. They have no weight. We just empower them. We just give them the power, but worrying itself has no power, unless you give it, give the power to the worry. And when worries come, You do this “blow it out, try it”. When worries come just blow out, come on worries have no power. No weight, it just goes off when you do that. Worries contained in your head, mind, just shake it away. They have no power whatsoever to do anything to you. But always focus on your heart and mind. What can I do for other people? People who are in difficult situations, people who are in need, that should be your agenda every day. Not on your problems. If you seek first the Kingdom of God, everything else will be alright. That’s how we fight against anxiety. I hope that you cultivate these spiritual disciplines to fight against your worries and anxieties. So these three things; first entrust your basic needs in God’s hands, two turn your worries into prayer, three focus on good things you can do for God and for others. I hope that this will help you to deal with your own worry problems.